Opening hours during the season: I.01.-XII.31. Spa Bük is situated in Western Hungary, 25 km from the Austrian border. The four star hotel lies in extensive natural surroundings. It is a weelbeing oasis, awy from the hustle and bustle of the world, where you can treat your body to everything that nature provides. Safe, fax, telegram, currency exchange, laundry and valet service, optician salon, beauty parlour, hairdresser, souvenir shop, Danubius Service with leisure programmes, hostess service, hotel taxi, private parking lot. 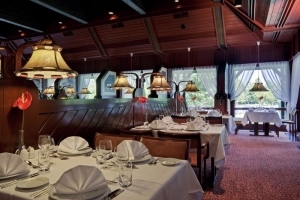 Our Nils Holgersson Restaurant with terrace offers Hungarian, international and diet menus. The Drink Bars in the foyer and in the garden, the Night Club, Brasserie with bowling, a salon with library and a chess room are also at our guests' disposal. 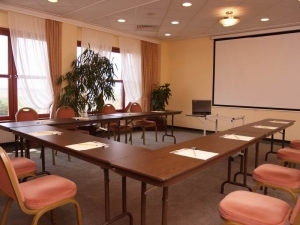 Our well-equipped function rooms and wide range of recreational and sport facilities make it possible to host meetings and seminars to the highest standards. About the thermal water Today Bükfürdő is one of the most important health resorts of western Hungary. The medicinal water, comes up from a depth of 1282 m, with a temperature of 56o C. It belongs to the group of thermal waters but, because of its salt content, it also belongs to the group of alkaline calcareous, hydro-carbonic waters. With a free carbonic acid content above 1000 mg, it also meets the internationally established criteria for carbonic acid springs. Because of its high content of calcium, magnesium, hydro carbonate, carbon dioxide and iron, it can be used both for drinking and bathing therapies. Using the relaxing effects of the natural resources, our "Well-Being Stays" are focused on relaxation, re-energising, beauty and preventative programs. They are recommended for the active individuals, who appreciates their health and are willing to invest in it. Danubius are continually in the process of introducing new and exciting relaxation and wellness treatments. Here are just some of the main services you will find available in the spa. (No treatments on Sundays and national holidays (1.01., 15.03., 1.05., 20.08., 23.10., 1.11., 25-26.12., Easter and Whitsun). Some Balneotherapy and Hydrotherapy treatments are recommended for relaxation purposes under doctor's supervision. Please ask for more information at the spa.